The online buzz surrounding 633 Engineering is growing rapidly, so if you want to beat the likes of Carlton, Ford and Mayer to the 633 owners' club, speak to Cliff Brown now! Astounding tone; harmonics and controlled dynamic response are arguably the best we've ever heard from this style of amp. Apart from the price, it's very difficult to fault this amp. There's a general perception that because the Americans started the whole 'boutique' amplification market, they're better at it than anyone else, and, to be fair, they usually are. However, this month we're looking at a new brand from the UK that threatens to upset the applecart with a heavyweight reputation that's already attracting international interest. Aside from founder Cliff Brown's CV, he's also a seriously good player. So, 633 Engineering offers a range of contemporary heads with some unique features and a service that is truly bespoke, meaning you can specify a variety of tweaks to bring you closer to your vision of the perfect amp. Here, we're looking at the Custom 36, a bespoke product (this one is actually on loan from a 633 customer). The head is surrounded by a high-quality birch ply sleeve, fabricated on CNC equipment for a flawless finish and consistently accurate joints. Behind the elegant computer-engraved control panel, there's a heavy-duty aluminium chassis that supports all the electronics. All the components are top quality - Hammond transformers, Neutrik sockets and Vishay capacitors are more commonly found in lab equipment or high-end studio gear, while the wiring has the same look and feel of some classic valve studio outboard modules. The attention to detail is almost obsessive. For example, Brown dismantles the rotary switches and hand-files the register plates to achieve exactly the right kind of 'click' as the switch is used. "To be able to take what is an already superlative platform and then have the option to customise it to suit your own needs puts 633 in a class of its own." 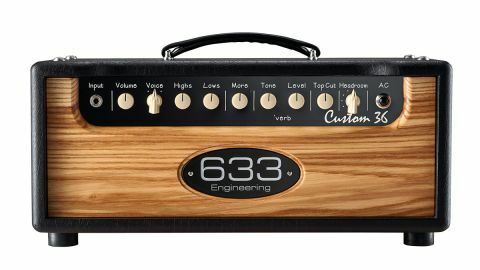 The Custom 36 is a single-channel amp with expanded EQ, a footswitchable boost that 633 calls 'More', and a clever variable headroom feature that progressively raises or lowers the amp's output wattage from full power down to around six watts in five steps, as well as changing from fixed bias to cathode bias. Other features include a high-quality digital reverb with a choice of delay times and bright/dark tone settings. The Custom 36's included footswitch is a single-button affair that simply operates the 'More' boost. The valve-rectified Custom 36's panel has knobs for Volume, Highs and Lows, More (boost level), Reverb Level and Tone, and a global tone control called Top Cut. The voice switch is a rotary three-way instead of a toggle, to match in with the headroom switch. The rear panel has a line-out with three level selections, a pair of speaker outlets with an impedance switcher, together with a separate speaker outlet that also powers an illuminated speaker cabinet logo, and a four-way reverb selector switch. Overall, the amp is built to a standard that matches or exceeds the very best we've ever seen; the attention to detail holds up under close inspection, beating many high-end mass-produced products. a PAF-powered Les Paul Standard and an original 1972 Les Paul Custom. The amp powers on smoothly and quietly, with the illuminated 633 logos ramping up in brightness rather than just switching on - very cool. Played clean, there's a level of clarity we haven't experienced before with any guitar amplifier, helped by the almost total lack of background hum and hiss. But where you might expect such transparency to magnify every minuscule fret buzz or fluffed note, the 633 seem to have a magic filter that removes the bad stuff. No matter what instrument we plugged in, they all sounded more focused, resonant and alive, with a very subtle compression that makes notes and chords hang in the air with an almost three-dimensional presence. The overdrive tones are warm and smooth, with a strong USA influence and a controlled dynamic response that means all of the note is heard, not just the attack. The individual tonal characteristics of all our test guitars were distilled and focused; the variations between the Strats and Les Pauls we used were more obvious than ever before, highlighting subtle differences such as the fatter midrange punch of the '72 Custom and the slightly scooped PAF tones of our LP Standard. The same subtle compression effect that flatters the 633's clean sounds adds an almost unearthly sustain that makes soloing great fun, with tricks like doublestop bends and pinched harmonics all too easy to pull off. "That effect is deliberately designed in," says Cliff. "I noticed it on an early amp and traced it to a faulty component, then I had to work out how to duplicate the effect and control it." The valve-rectified Custom 36's simple controls and one-button footswitch govern an edgy, aggressive and dynamic feel that's easily tamed by turning down the guitar's volume control. Used like this, 633 heads clean up better than any other amp we've tried, making them ideal for old-school players who drive everything from the guitar, while the medium gain preamp makes them ideally suited to pedalboards as well. Sonically, they're both perfect for guitarists who play rock, blues, jazz, funk, country and everything in between, and by balancing the gain, master and headroom controls, it's easy to dial in the perfect blend of pre- and power amp distortion at recording, practice and gig levels, making the 633's ideal for any venue. Amps in this price bracket need to perform to exceptionally high standards to justify themselves, whether they're one-trick ponies or ultra-flexible jacks of all trades. The 633 Custom 36 has enough range to handle anything within the above genres, with tones that will rock you back on your heels when you hear them. The Custom 36's owner-driven spec hits the performance and sonic bullseye for us - it's simply the best amp of its type we've ever plugged into, and we're including some boutique exotica in that statement. Does it perform well enough to justify a price tag of well over three grand for a head and 1x12? We'll nail our flag to the mast and say definitely, yes. To be able to take what is an already superlative platform and then have the option to customise it to suit your own needs puts 633 in a class of its own. Aimed at affluent amateurs and the most discerning pro players, these amps are built to last. Add up how many amps you might buy in the rest of your playing career and 633 looks to be great value for money in our book.